Making charity a two-way street with a genius "One for One" initiative that brings durable footwear to children in need every time a pair of shoes is purchased, Toms' footwear designs are both stylish and comfortable, with a wide range of selections for men, women and kids. In addition to the regular mens, womens and kids sections, the site features a great TOMS outlet with a variety of TOMS styles for less. Shoes in this category are discounted by as much as 50%, so remember to stop by if you want a pair of TOMS but are reluctant to pay full price. The site also offers free shipping on orders $75+ and 60 day returns. $ off your order when you spend over a specific amount and apply your TOMS promo code. % off site-wide with you TOMS discount code. % off in the TOMS sale section when you apply your code. Free shipping on orders under the minimum shipping threshold. 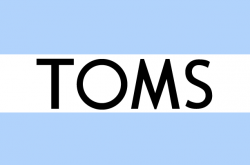 Most TOMS coupons will get you anywhere from 10% to 20% off you order, so be sure to keep your eyes open for new deals. Redeeming your TOMS coupon code is about as easy as making a difference in the world when buying from the company. Click on the deal you'd like to use and copy the code from the pop-up window. When you're done shopping and are ready to checkout, click on the bag icon at the top, right-hand corner of your page and select " Checkout". Once you've hit the Payment page, paste your code into the coupon code box under the order summary. Toms Canada are a unique shoe style that also helps out someone in need with every pair purchased. They have styles for men, women and children of all sizes.